Another Cotton Mill Row done. 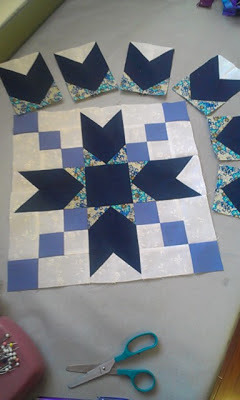 AT the Cotton Mill Guild, we are working on a Row of the Month project. We were given directions for the forth row at our last meeting in December, (which was a really snow-stormy day). We needed to make 64 * 2.5" blue and white half square triangles and sew them together in this format. We could use any method we wanted to, so I used a paper method for sewing my 2.5" finished half square triangles together. I used 5 pages and part of another to get my 64 squares. The paper templates are free by downloading here. Sewed my row yesterday. I'm enjoying this slow paced project and gives me a small project to do in between my larger projects. Here are my Four rows so far. It's been a fabulous Christmas week. I did manage to get some time in to sew my 30 blocks together. The seams are pressed and it's hanging over my railing waiting for the two outer borders to be put on. I'm still undecided if I should put cornerstone blocks on the outer border or not. The outer border is plain white. I love that because the hand quilting designs that turn a corner are so impressive...... hmmmm. I think I just made my decision. Plain white it is. In this 6th week of making the St. Dunstan's 2013 Raffle quilt, I'll finish the two borders, make 380 inches of bias binding and a quilt label. 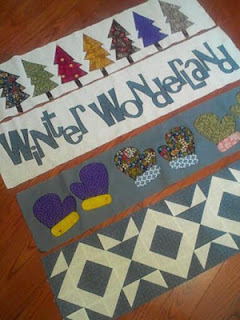 Check back next Saturday for the final package that I will deliver to the quilters on January 10th. We've had some nice visits with all our kids starting on Christmas Eve. It's hard to believe Christmas is over for another year. This evening, we all going to see the Duffle Bag Theatre's performance of Rudolf at the Playhouse. So Aurora and Grace are with me today and others will join us this evening for the performance. Aurora put me right to work this morning to mend her favorite pair of jeans... And more importantly, she wanted me to make her new walking Baby Alive some clothes. A new hat, coat, mittens, and snow pants. 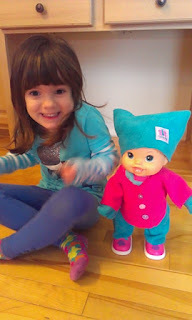 She's as pleased as punch for her outfit to go outside... She picked out the colors of fleece, the buttons and even a little patch for the hat. I merely sewed. Success. I finished my 15 Blackford's Beauty blocks this week. It was more work than I anticipated. I also have the 15 white alternate blocks cut, and I've laid out the center part of the quilt on the bed. With this being the Christmas week and likely to be filled with visitors and visits, I'm setting a small goal of sewing these 30 blocks together. Surely I can get a couple of hours in. Does this little fox look warm and cozy. This fun little scarf is just perfect to wear around the house. I used a wool blend fabric on top, and a nice soft white minky type of fabric on the underside. So cozy.... I had intended on making these with the kids at my mini-Grammie camp the weekend before last. But, we had too many activities to do in such a little bit of time. I told the kids I would make them up for them. I'll give it to them this weekend. Cute eh! Want to make your own, it's a free tutorial... click here. Update: I finished the other 3 foxes. Now they are hanging over my railing waiting for the kiddos. I love them. I'll try to find photos of the women wearing real ones in the old days. It might bring some meaning as to why I think these are so cute. This quilt has been on the frame for over a year. We are only a small group of quilters hand quilting at the church. And we only quilt is good weather. If it's snowing or uncomfortable to drive, we don't quilt. So it's taking a while. We don't mind at all though. No pressure is on us to get it done. Since the choir practices on Wednesday afternoons when we quilt, we have been enjoying all the Christmas music. And after the practice, we get little visits from choir members and others who happen to come through the doors. We are almost ready to roll both side of the quilt. Right into the center row of stars now. We are done until after the holidays now, but we will only a few weeks left to quilt before this beautiful quilt will be done. We've given it a name and I will make a label this week. Catch a Falling Star. Just like Perry Como's song. Do you remember the words. I've been singing it in my head all week. This beauty is making progress. Although, this week was the busiest for me during this Christmas season. Lunches, meetings every day. So, I didn't get all that I hoped to done this week. 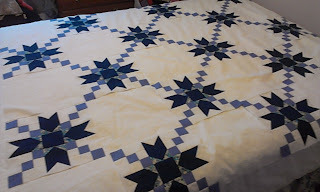 I do have one of the 15 pieced blocks complete, and many blocks ready to sew the nine patch format together. The diagonal seams require a bit of brain power to make sure they are going in the right direction. This week should be a lighter week for us, with not so many Christmas activities. So it should be no problem to finish the other 14 blocks. Do you like a complicated block? It's going to be stunning when placed by a plain block that will be filled with a hand-quilted circular feather pattern. See the cute ears, and his little tail in behind. I'm going to a pot luck lunch tomorrow with a small group of quilters who meet to hand quilt every week. 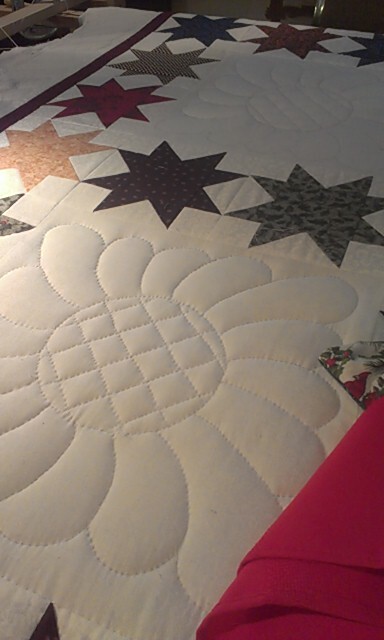 Although, I don't do any quilting with them, I do visit with them on a regular basis so they invited me to lunch. After our lunch, we will do a Yankee Swap. Want to see what I'm bringing? 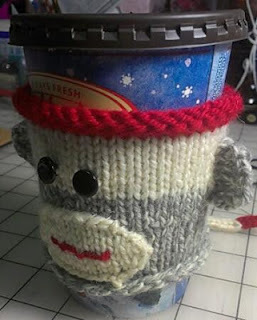 A Sock Money coffee cozy on a Timmy's cup. And in the cup, the pattern and a kit of yarn to make another one. Cute eh! 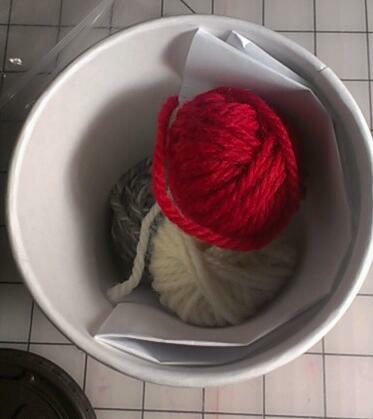 PS: The pattern is free on ravelry. Search George Coffee Cozy. Caitlin, Grace, Mitchell and Aurora were here over the weekend. 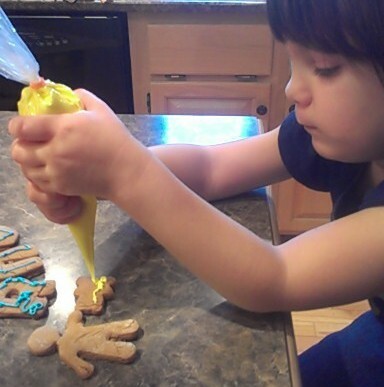 Among the many games and activities we did, was our annual gingerbread making and decorating time. 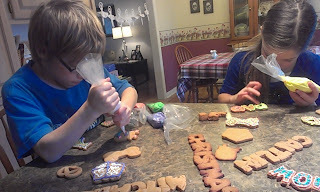 The kids are pretty good at deciding what they want to do. 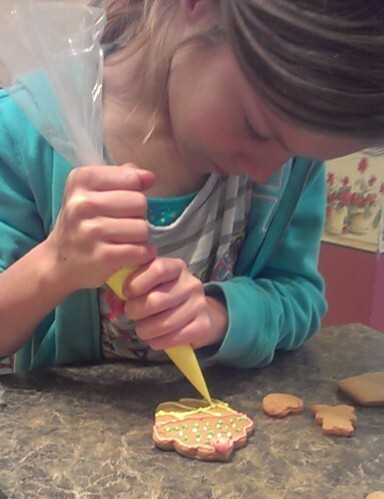 The alphabet cookie cutter set is always popular. My friend Lee gave them to me years ago. They're a priceless part of my collection. Now Aurora even wants to do her letters. Do you think the kids eat any cookie dough? It's subtle, but watch..
Got my sixty nine-patches done. Well, they aren't quite nine patches, but that's what I'm calling them. It went pretty quick despite lots of Christmas activities starting to happen. This is how the nine patches will be placed in the BB block. together, I am going to have to be very careful not to get confused! A Unique Gift Card Envelope. I bought gift cards for the kiddos for Christmas. Easy for us, fun for them. The gift cards come on larger cards and I thought I'd make these fun pencil cases that have lines sewed on to look like paper. 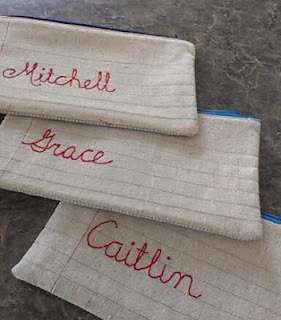 I hand embroidered their names in cursive writing because that is the font that they are learning to write in school. I have one more to finish. I wish my name started with an E or a J. They have such nice curvy capital letters. The card that the gift card is glued to, easily fits in this little pencil case. I used no particular pattern, but I did use the zipper technique from the zippy strippy tote. I'll write up the details on the measurements and lines on the faux paper if anyone wants them. 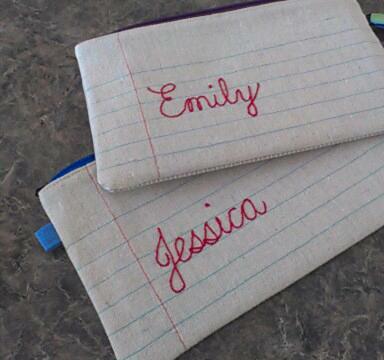 I printed out the names using a cursive font and stitched using my favorite sulky 12 weight red thread. I'm so impressed with the work that members of our Guild did this morning. This must be a record. We made the 70 Christmas Stockings with time to spare. We enjoyed talking to some of the seniors who live at the Terraces. Going in this morning, we had no idea how long it would take, but thought for sure it would take a whole day. 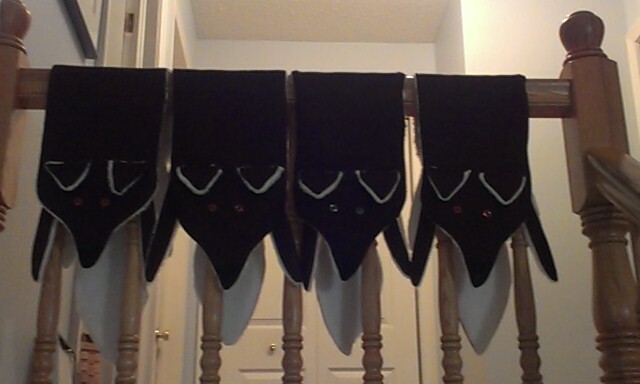 Well in 3 hours, the sewing was done. All that had to be done was fuse on the stars. A great day, and I'm so glad we said we would help. 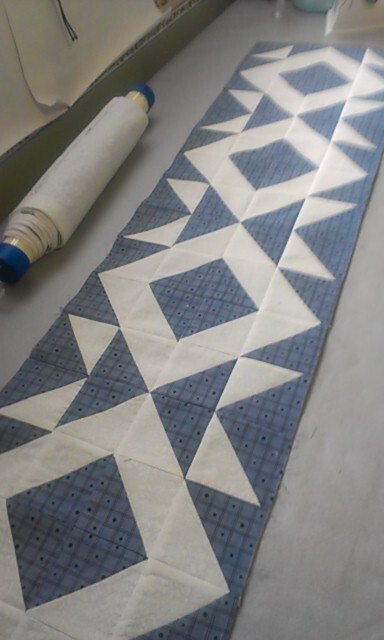 Check out the photos on our Cotton Mill Quilter's Guild blog. Do you have this ruler? I'm beginning to like this ruler. 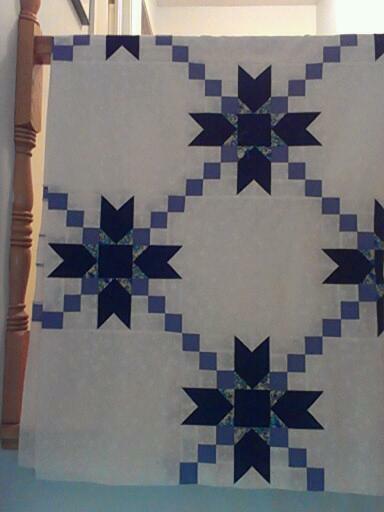 I bought it last year at a quilt show. While I plan to sometime, I have yet to make any leaves from it yet. I used my FriXion pen to mark the gentle curve before sewing. 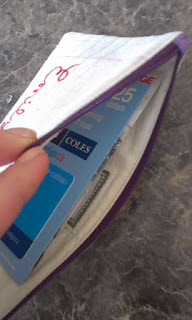 Recently I've used it for a couple of non-leafy projects and I'll share how I used it today. While making some simple runners for my hallway tables, I was looking for an alternative shape to square ends. A quick glance up at my ruler holder and I knew what I would do. It was just too easy. My runners are 12" wide and there are convenient 6" markings either side of the center point on the ruler. Following the curve of the ruler, I simply made a marked line on the fabric to sew on. It was perfect for for today's project. Voila. Turn right side out and lightly press. than plain squared off ends. My fellow Cotton Mill Guild members and I are working on a special project this coming week. We were asked last week by a rather new Seniors Care home and residence to help them out by sewing some small Christmas Stockings for their 69 residents. At first I wasn't confident that we could do it, but a quick email to our members brought 9 or 10 volunteers. So the planning begins. 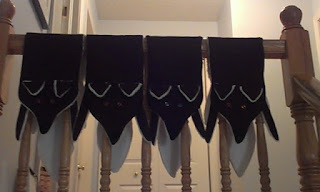 I measured and tested to get 70 of biggest lined socks I could out of the material provided. It turns out to be about 10 inches tall. I'm pleased with that. I've made a prototype sock. 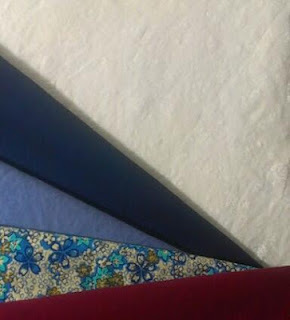 A beautiful silk like fabric with slight color blocking. While I love the look of simple white silk stockings, I think for the seniors, it needed a bit of something. Out comes my Sizzix. I have less than five dies, but one of them is stars. So red stars it is. I like the look of the prototype better. I'll fuse fabric and pre-cut a few hundred stars before our sewing workday begins on Tuesday. We will sew assembly line style in the large activity room at the Seniors residence. Even though, this was a last minute request, I know we'll all feel good for doing this for the seniors. I like the red stars on the silk fabric. If you are in the area of the Terraces Seniors Home (just past the Willie O Arena), why not drop in to say hi. We'll be there from 9am to 3pm. All are welcome. So, 1 down, 68 to go. I have a hard time to figure out where the time goes. It seems like just a couple of months ago, that I was making St. Dunstan's Log Cabin quilt.... but in fact a whole year has gone by. I revealed the quilter's pick for their next raffle quilt a few weeks ago. It's Blackford's Beauty. 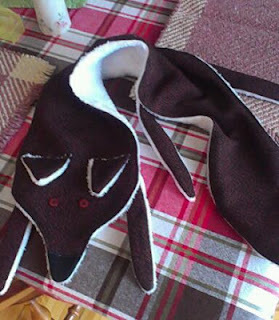 I will be using Bonnie Hunter's pattern. Only our colors will be slightly more traditional. The quilters want to do some lovely hand quilted wreaths in every other block like the one I showed last month. I have the fabric and it's washed ready for ironing and then cutting. This will be my big project for December. I'll report on it on each of the 5 Saturday's in December. I will deliver it to the quilters right after the New Year. So this week. I will be preparing the fabric, figuring out the quilt math, and completing the sixty 9-patches that I will need for the 15 pieced blocks. Doesn't sound to bad...I'm sure I can get that done.